5.4" x 6.4" stitched on 14 count. 4.2" x 5.0" stitched on 18 count. 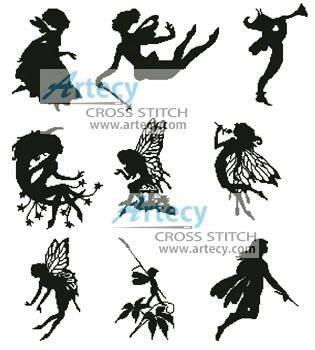 Little Fairy Silhouettes cross stitch pattern... This counted cross stitch pattern of a collection of different Fairy patterns was designed from clipart. Average size for each design in stitches is 75w x 90h. Only full cross stitches are used in these pattern.